The Boy Scouts of America was officially incorporated back in February of 1910. Over the last 100+ years, the organization has welcomed millions of boys into its folds and taught them valuable life skills. 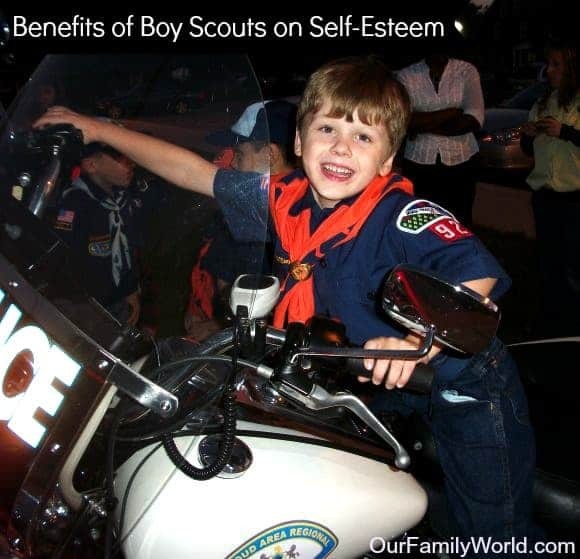 The effect of Boy Scouts on a child’s self-esteem can be tremendous, especially for a boy who may not feel like he is good at other physical activities, such as sports. It’s also a more cost-effective option for many parents, since the annual fee is less than $100 and can be offset by financial assistance, making it typically less expensive than most sports. Boys gain a sense of accomplishment through earning of badges, belt loops, and pins. The Boy Scouts has so many opportunities for boys to earn accolades through both doing what they’re good at and trying new things. The great thing about these awards and merits is that there are so many different types- from physical activities to academics- that all boys have a chance to earn at least a few. A boy who is great at sports can earn belt loops and pins in areas such as Volleyball, Baseball, and Hockey, while a more academically minded child can go for Arts, Photography, and Computers. Awards for showing expertise in a subject. Aside from basic badges and awards, boys have a chance to really show off their expertise in a subject and earn recognition for it. For example, if your son is a budding scientist, he can go through the steps to earn he Cub Scout Nova award by watching shows about science, discussing what he learned, earning a belt loop in one scientific area, and putting it all together with a science experiment. Showing off personal talents is a great way to boost self-esteem! Chance to try new things without pressure. Many packs hold a “Try It” sports night or something along that theme. Each night features a different activity, such as a basketball night, a volleyball night, and so on. This gives boys the chance to try out different sports and find out what they enjoy without the pressure (or financial commitment) of signing up for an entire season. If they discover they’re good at something, they can pursue it further. If they don’t do so well, it’s not such a blow to self-esteem because there’s a good chance at least several of the other boys also won’t excel at the sport. Den activities focus on earning achievements in a fun way. Most den meetings are designed around giving the boys a chance to earn achievements. Activities focus on letting the boys show off their creativity or encouraging them to learn a new skill. At the end of the hour, boys have a brand new reason to feel sense of accomplishment and pride. For example, at a recent den meeting, we had the boys (all age 7) prepare a dinner for us. They went through all the steps of cooking a meal with supervision to create a healthy meal. At the end, they even did the dishes! They were so proud of their accomplishment! Helping others. The Scouts participate in many events to help others, including food drives and litter cleanups. Helping others (or the environment) gives a boost to self-esteem because it shows that even one child can make a difference. My son started Cub Scouts in 1st Grade. He’s in his second year, and he still loves it. The variety of activities keeps him interested. Every time he gets a new award, he’s as proud as can be and I can literally see his self-esteem go up. Even when he’s not working towards an award, he’s still having a blast! Boy Scouts and Girl Scouts are wonderful organization that have helped thousands of kids improve their social skills, life skills and self esteem. But, in order for these organizations to remain as effective as they used to be they need to update their policies and become more inclusive. Their unwillingness to update their policies is starting to portray them as organizations that may in fact contribute to bullying instead of help prevent it. These recent problems within these organizations is the reason why I am hesitant to enroll my kids. I use to be in Girls Scouts and it helped so much with my sellf esteem!! Sounds like it works great at boosting confidence! I had the best time when I was in the girl scouts and I’m hoping that my grand daughter will join soon. Its good the read that he’s having a good time. Oh, I loved boy scouts. I was a girl guide but when I got to join in on my brother’s boy scouts activities, they were always so much more fun!